Scotland’s health secretary ordered a review of the design of the Queen Elizabeth University Hospital after the deaths of two patients. The hospital has put infection control measures in place, and officials insist it is safe for patients and visitors. 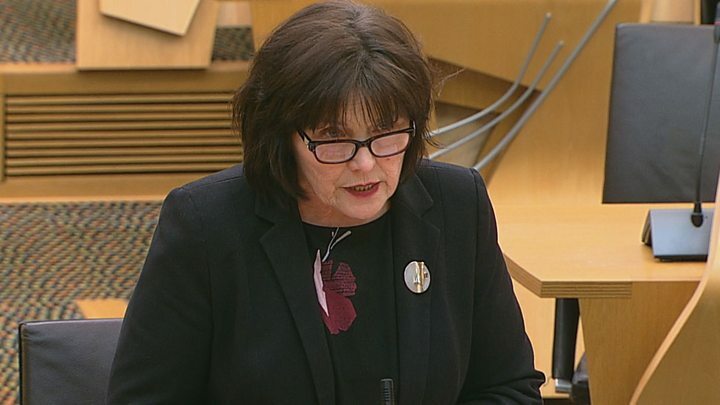 Jeane Freeman said there was an “absolute focus on patient safety”. At the weekend, it emerged that two patients who had died at the hospital had contracted a cryptococcal fungal infection which is linked to pigeon droppings. Ms Freeman said one of the patients was elderly and had died from an unrelated cause, but that the infection had been a “contributing factor” in the death of a child. The likely source of the infection has been traced to a 12th floor room containing machinery, which is not open to the public. Ms Freeman said traces of excrement had been found in the room, where there was a small break in the wall which was “invisible to the naked eye”. The health secretary spoke to the chief executive of NHS Greater Glasgow and Clyde and senior clinical staff to seek reassurance for patients at the hospital. She told MSPs: “In November, the bacteria cryptococcus was identified in one patient. That patient was discharged for palliative care and sadly subsequently died in late December – but cryptococcus was not a contributing factor in their death. “In December, a post mortem of a child who had passed away confirmed that cryptococcus was both present and contributing factor in their death. Ms Freeman also revealed in her Holyrood statement that the hospital was also investigating a separate, “totally unconnected” infection, after two patients tested positive for a different fungal organism. A water leak has been identified as the “likely source”, but the health board said “other investigations continue”. The identification of two cases acted as the trigger for additional infection control measures at the hospital, including antifungal treatment for potentially vulnerable patients. The health secretary said NHSGGC had kept patients and their families updated on an ongoing basis and would ensure they had the opportunity to discuss concerns with the senior clinical team. Portable HEPA air filter units have been installed in specific areas as an additional precaution. There have been no further cases reported. Ms Freeman said a review of the hospital’s design and construction would take into account “a number of issues” from recent years. She said: “There are two strands to this. The first is to deal with the current infection, which the board has done thoroughly, they’ve taken all the measures they should take. “The other is the building itself. We need to be absolutely sure about the current state of this infrastructure – what do we need to fix, how has that arisen, and what are the lessons for our build elsewhere in the health service. “That may be in aspects of the design that we weren’t aware of at the time, it might be in aspects of the commissioning, it might be maintenance, or maybe a combination of all of those. Multiplex. the building firm which worked on the design and construction of the hospital, said it had not been contacted about the review but “will of course assist with the Queen Elizabeth project team if we are requested to do so”. Prof Jason Leitch, NHS Scotland’s national clinical director for healthcare quality and strategy, said he was “assured that this hospital is safe today”. He said: “That doesn’t mean there aren’t issues around the building that need reviewed and looked into, both for this building and to learn for Scotland. Scottish Conservative MSP Annie Wells, who represents Glasgow, said this was “simply not the kind of scenario that should be unfolding in Scotland in the 21st century, and absolutely not at such an expensive and newly-built facility”. And Labour’s Monica Lennon said there had been a “laundry list of problem which should have set alarm bells ringing at any hospital, never mind Scotland’s flagship hospital”. On Sunday, former health secretary Alex Neil called for an inquiry into the deaths as it emerged concerns were raised in December. ← Has Fyre Festival burned influencers?